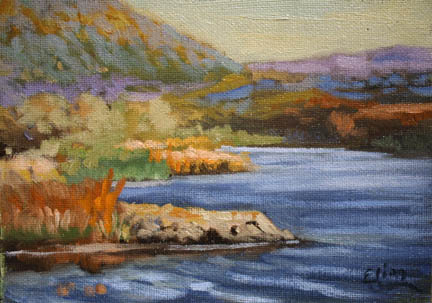 Lake Matthews View, 9 x 12 acrylic. 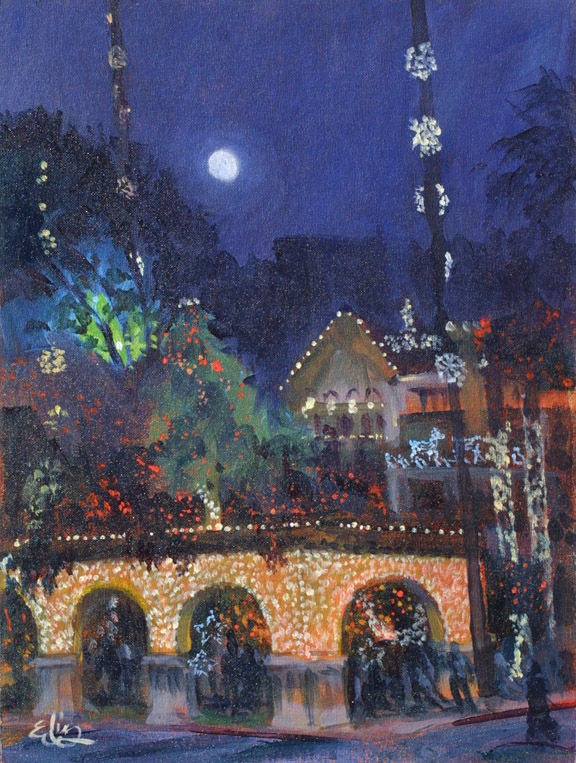 To share the joy of the Season, here's an original acrylic painting full of holiday lights done on location at the Mission Inn in downtown Riverside a few weeks ago. 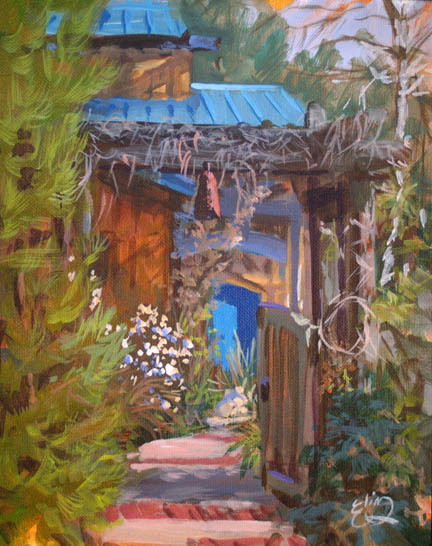 I've been with the Plein Air Artists of Riverside who have been painting on location to capture the merriment and holiday lighting displays for which the Inn is famous. When the moon was full this month, I set up with Sparky (yes, he came along and played "announce dog" to anyone who came close) in a planter bed diagonally across the street from the arches and buildings of the Inn. They decorate the palm trunks with huge snowflake lights, too. This is a 16 x 12 acrylic, done with those open acrylics, and I'm quite pleased with it for having captured not only the lights and the holiday feel of the building, but also the natural world of the night sky and full moon. The open acrylics allowed a longer working time, yet the Color System make the choices for this piece easy, even though I was working with a flash light in my hand! When I go out again on Dec. 29th, I'll have some nice LED lights that will shine both on my painting and palette. If you've ever been to the Mission Inn (opens in a new window) it is quite a famous landmark for its architecture and holiday lights. 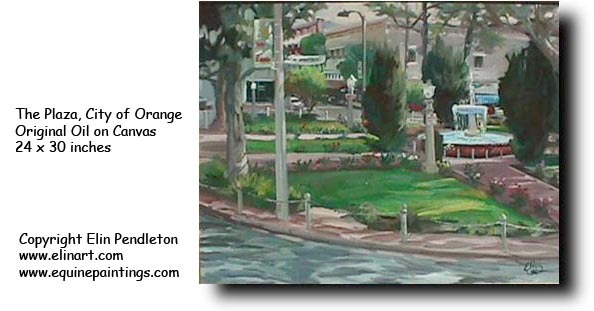 I'm pleased with this painting of it, and hope you enjoy it as a sharing of the holiday spirit with us! It doesn't have a show schedule, so it is available, $300 to add to your collection. 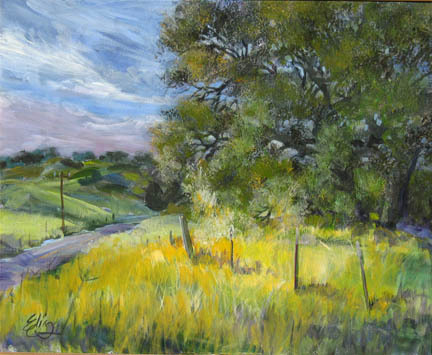 "Along the Road to Tenaja" I'm pulling work out of the racks and making selections for the show up in Tenaja, for the Cowboy Jubilee. It's fun to look once again at some of my earlier pieces, and this one needed a "bit of a jolt". 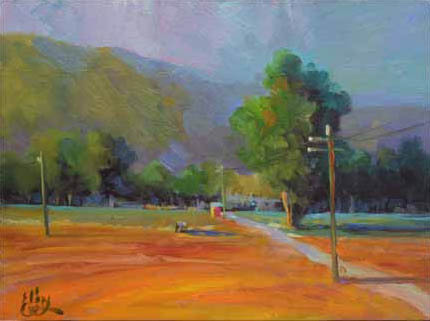 Used for the invitation for one of the summer art shows at the Visitor's Center, This 24 x 30 acrylic was painted on location and shows Rancho California Road heading toward Tenaja. I was in the Sylvan Meadows parking area. I tweaked it a bit, brightening up the foreground and unifying the sky into more closely related values. 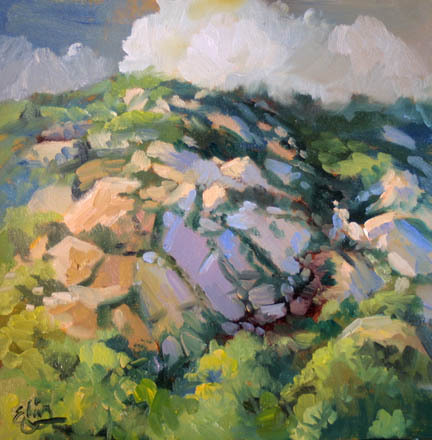 My goal was to have the feeling of passing cloud shadows throughout. Every once in a while I get a hankering to do a series of seasonal images of one scene. 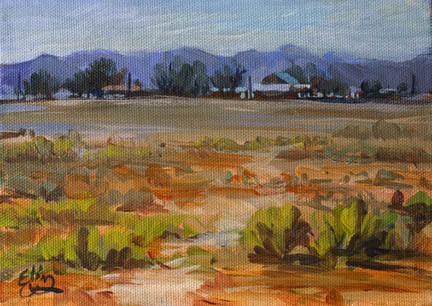 Thus today's painting, a 5 x 7 acrylic of a farm landscape near where I used to live, closer to Hemet. This is another of those places that is quickly disappearing, as the area is desirable to developers because it is flat, and lends itself to cookie-cutter tract homes. It remains there so far, yet I expect to find it missing in any month in the future. Now we will see it go through four seasons in the next four days--and here is autumn for your pleasure. I love the blue/orange play of color. 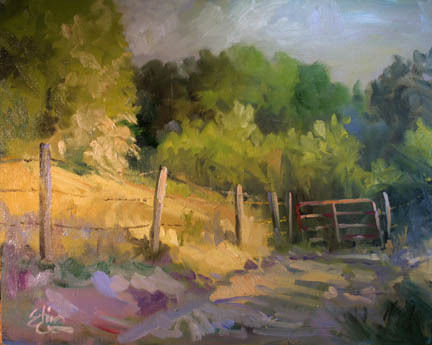 The summer flushness is gone, and the field lays fallow for the coming winter (tomorrow's painting!) Orignal 5 x 7 acrylic $120. Brrrrr!!! Yesterday's fall weather has changed with this decent snowfall over those fields and with the trees now completely bare. What a change from yesterday's autumn colors, yet the scheme is still blue and orange--just really subtle oranges! I think I'm going to enjoy spring when it comes through tomorrow! Orignal 5 x 7 acrylic $120. "Spring has sprung, the grass has rizz, I wonder where dem flowers is? "...That's a silly ditty taught to me by my mother. Well, here are some spring flowers along the path, and a field of mustard with its characteristic lemon yellow flowers. 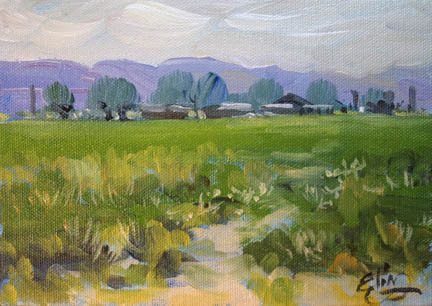 We see the same barn off in the distance, and the purple mountains creating another complementary color scheme. Darn it! Guess I can't get too far away from those schemes since nature wants us to see it. Orignal 5 x 7 acrylic $120. 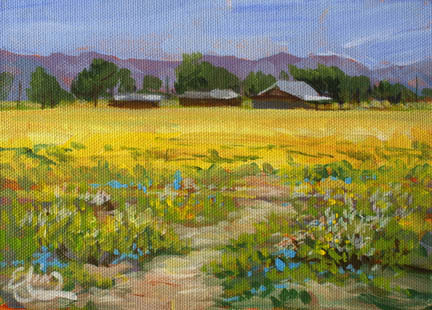 "Summer Field" The final image of the four paintings depicting the seasons. The first one (Autumn, February 7) came from the source photograph, the other three are completely out of my imagination. The Color System makes it really easy to choose colors that work, and even change the season, because you have room to play since many of the problems are solved for choosing the color. I really enjoyed doing these four paintings, however now I need to produce some more serious work for galleries and the designer. Orignal 5 x 7 acrylic $120. 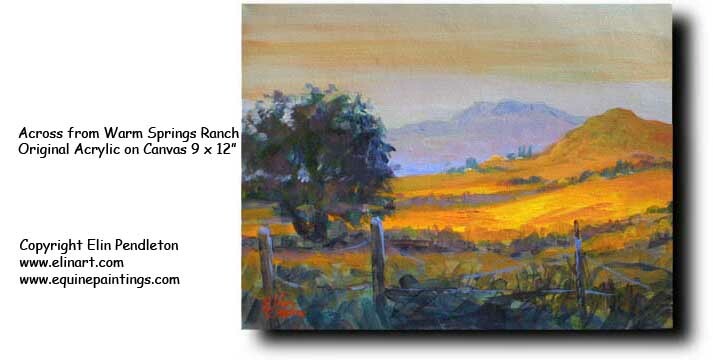 "Sunshine and the Field" Back in 2000 I was on location south of Fallbrook, California, and painted this field scene. 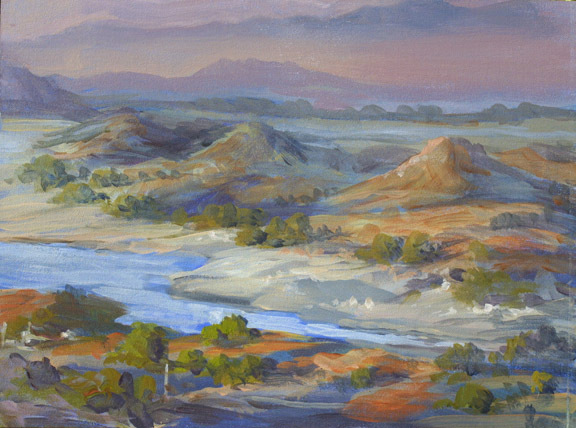 Today I paint it with the Color System knowledge and made the landscape sing. 12 x 16 oil on board. 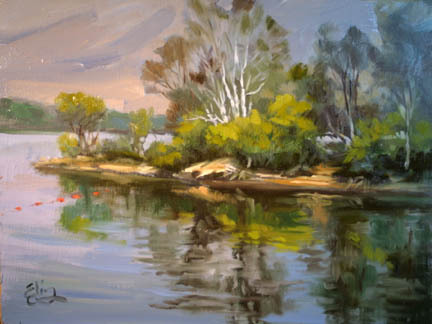 "Revision of Lake Evening" Today in the studio I worked over several canvases, and the one that provides the most learning for students is this one. 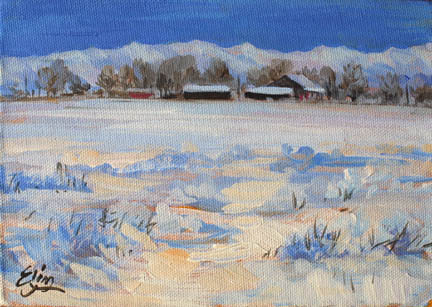 If you'll compare the one on February 3rd, you'll see the original plein air study. 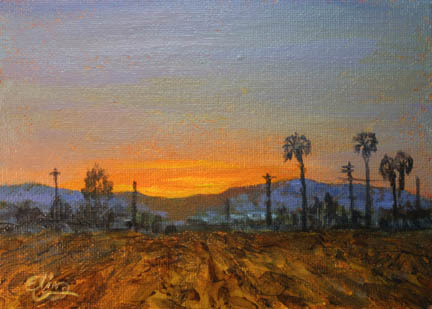 Original oil, 5 x 7 inches, available for $100. 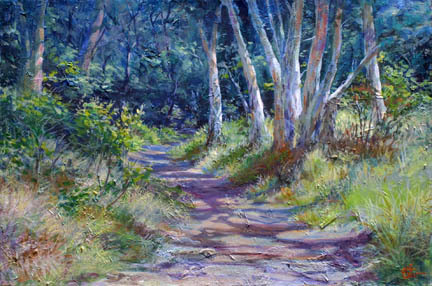 "California Ridge" Today I took a break from working in the studio to make a new hiking trail on the mountain behind our place. It was about 3 p.m. and entailed the following steps: I took the machete out and sharpened it on the grinder. I led Vincent van Goat out of the pen and put his pack saddle and red pack bags on, loaded with water and my sweatshirt, and off we went. The mare (who thinks Vincent is her foal) went crazy neighing and running back and forth most of the time we were up on the mountain, creating quite a dust storm as she galloped back and forth in the corral. Using the machete, I cut about three-tenths of a mile of new trail through the brush until the sun was gone and it started to turn cold. Trail cutting is both hard work and euphoric, and I do enjoy it. A new hiking area is opened up, I can let the terrain guide the location and direction of the trail, and working in the company of a friendly white goat is very much in touch with nature. 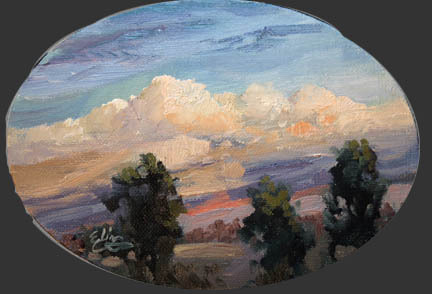 "Early Light" I picked up this oval canvas that has been sitting around for what seems like forever, and painted this early morning light on clouds , not thinking practically. Photographing this puppy for the web site and for this email has been a real "pickle." Here it is for your pleasure, camera shenanigans notwithstanding. 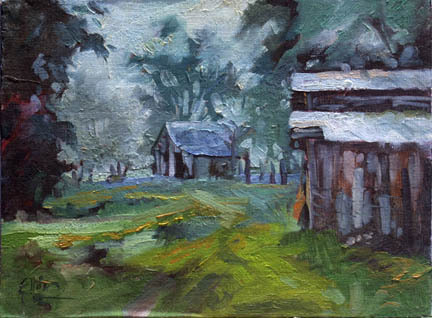 Original Oil, 5 x 7 inches, $100. 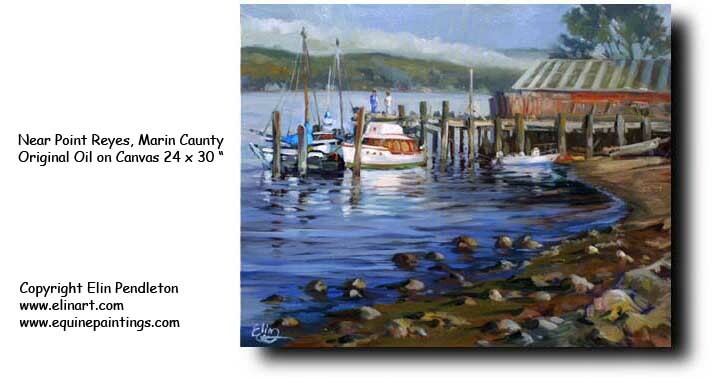 "Impending Change" Today's painting was done on location as I was getting new tires on my truck. I walked into a nearby field and saw this 80+ year old eucalyptus tree with a hawk's nest in it, and since it is sitting on soon-to-be-developed land, its days are numbered. The distant hills of Sun City are in the background. 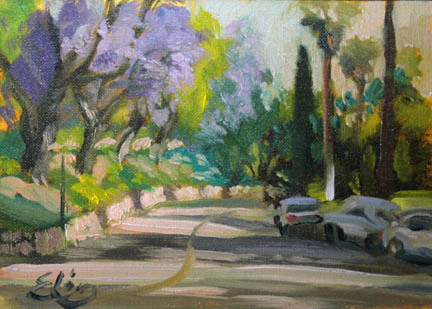 Original oil, 9 x 12 inches, $200. Below Five Mile Bridge After the morning light, Betty and I headed for the creek. It was just beastly hot, over 104 degrees, so I set up my gear IN the water. Looking to the north, this is the bridge that spans the creek at the Five Mile marker in Bidwell park. 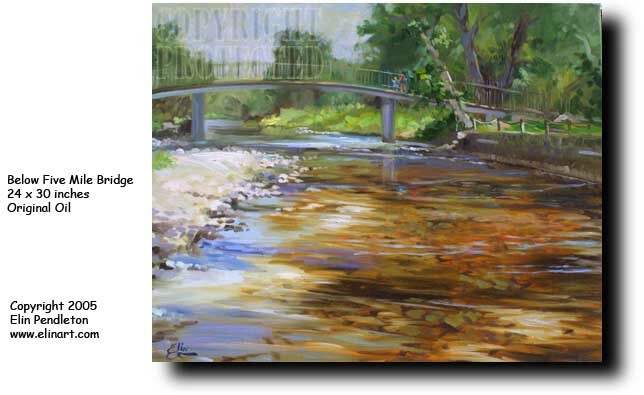 Painting furiously fast, this one came off the easel (missed the water!) in just over two hours. 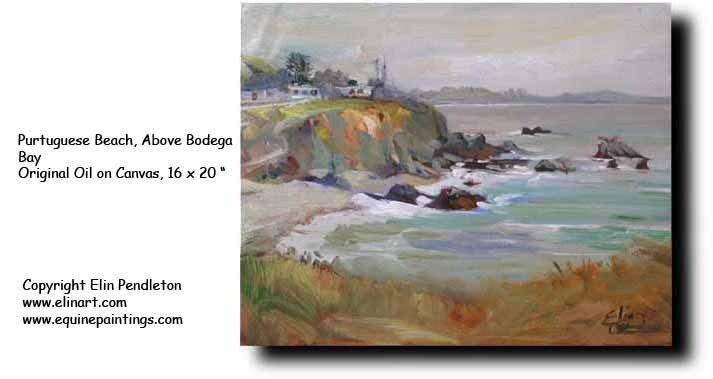 Original oil on canvas, 24 x 30 inches, $850 from the artist. 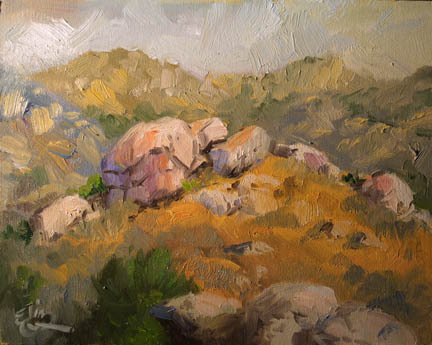 Evening at Hollister Peak Showing how Elin uses her color system to convey certain times of day, this lovely warm painting resulted from the demonstration video for depicting evening light. 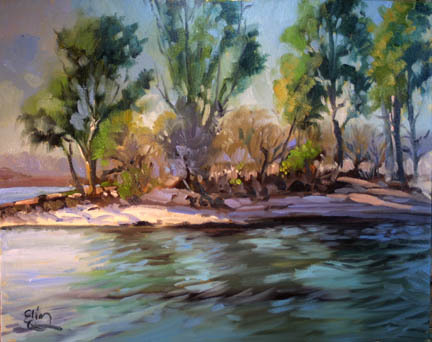 Featured in the DVD "Colorful Oil Painting 2". 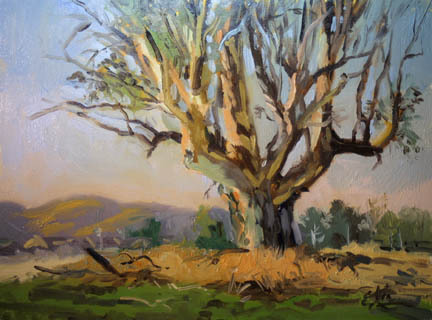 Original oil on board, 12 x 16 inches, US $550 from the artist. Water Dance, Del Mar Race Track At the track before the races, the staff of Del Mar are seen watering down the pathways where the horses will be, before the daily races. In watching the activity, Elin saw the workers doing kind of a "dance" with the streams of water. 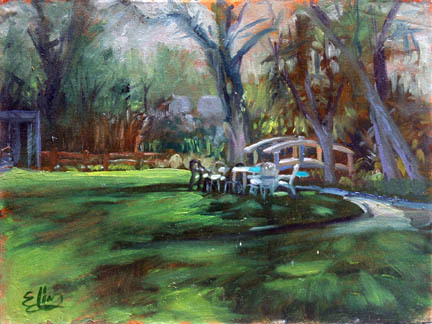 This, plus the beauty of the flower beds is now captured in oil paint. 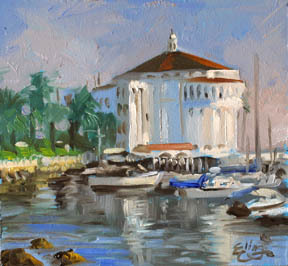 Original oil on canvas, 12 x 16 inches, in gold frame US $ 750 Email or purchase with your credit card through CCNow.com. The Blue Orchid In the city of Orange, there is an old filling station with a unique swayed roof. 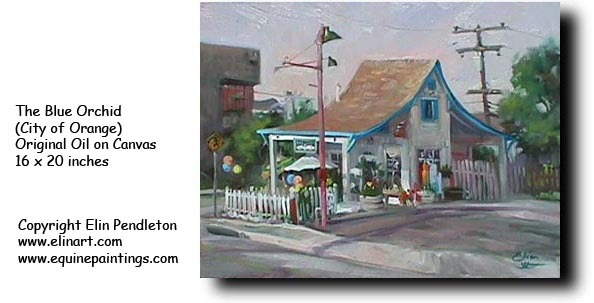 Now it is a flower shop, although on the list of historic places in Orange for its unique style. 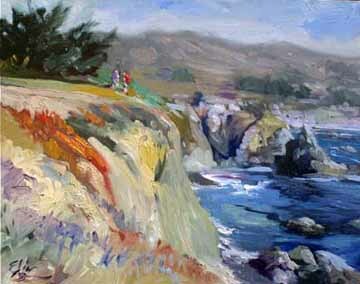 Original oil on canvas, 16 x 20 inches in gold frame US $ 950 Email or purchase with your credit card through CCNow.com.